My article, “‘The Leaning Tower of Pizzazz’: Ted Tinling, Couturier for the Women’s Professional Tennis Revolution,” has been accepted for publication by the journal Fashion, Style & Popular Culture. The article will be published in the July 2016 issue of the journal. 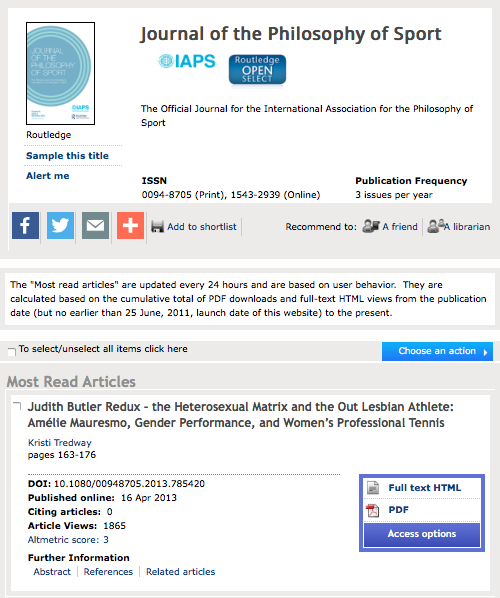 My article, “Judith Butler redux — The heterosexual matrix and the out lesbian athlete: Amélie Mauresmo, gender performance, and women’s professional tennis”, has been published in the Journal of the Philosophy of Sport — volume 41, issue 2 (the July 2014 issue), p. 163-176. This article has been available electronically since April, 2013.